Sonic the Hedgehog (also referred to as SatAM within the fanbase) is an American animated television series created by DiC Entertainment. First airing on Saturday, September 18th, 1993, the series (along with its lighter, syndicated sister show Adventures of Sonic the Hedgehog) was the face of the Sonic the Hedgehog franchise through the mid-90's. Especially in America, characters such as Princess Sally Acorn and Rotor Walrus became just as familiar as Sonic and Miles "Tails" Prower, even if they were never featured as characters in the games. The series was produced by companies in the United States, Italy, Spain and Korea. It was a co-production between DIC Entertainment and Sega of America, Inc. in the United States and Reteitalia S.p.A. in Italy in association with Telecinco; the animation work was outsourced to foreign studios such as Saerom Animation in Korea. Though canceled after only two seasons, the show maintains a cult following, with a rabid fanbase that continues to dig into the history of the show and dream of the day when the second season's cliffhanger can be resolved on screen. The setting and characters of the show served as the foundation for the Archie-produced comic series Sonic the Hedgehog, although the comic would also take elements from Adventures of Sonic the Hedgehog and the original video game series. The show was also dubbed into Japanese, airing on TV Tokyo. The primary cast of Sonic the Hedgehog season one. The show Sonic the Hedgehog revolves around the exploits of the title character and the rest of the Freedom Fighters as they go up against the evil tyranny of Dr. Robotnik and his nephew, Snively. As detailed in "Blast to the Past," Robotnik was once known as Warlord Julian, who had served under King Acorn (the ruler of Mobotropolis) during a conflict known only as "The Great War." With the war won, King Acorn orders the dismantling of the army, and prepares to change Julian's title to Ministry of Science. Unbeknown to him, Julian and his nephew have already plotted a takeover of the kingdom, and overnight transform the peaceful Mobotropolis into the mechanical wasteland known as Robotropolis, named after Julian's new moniker. While most of the population is roboticized, a small group of people are able to escape, made up of mostly children, including Sonic and Princess Sally Acorn, the king's daughter. Living in the hidden village of Knothole within the Great Forest, Sonic and Sally head up the group of Freedom Fighters, which include Rotor Walrus (the go-to tech guy), Bunnie Rabbot (the half-roboticized southern lass), Antoine D'Coolette (the comic relief) and Miles "Tails" Prower, though he is forbidden to go on most missions due to his age. Through the series, Sally plans various raids into the Robotropolis fortress, in order to impede the operation of the city, stop Robotnik's latest schemes, or to disarm his SWATbot forces. All the while, they search for their loved ones, Sally hoping to discover the fate of her father and restore him to the throne. The Freedom Fighters, though not technology prepared, do have a few secret weapons up their sleeves. The first of these are NICOLE, a sentient hand-held computer operated by Sally. The computer, which is able to bypass most of Robotnik's security measures, becomes an aid in infiltration and information. Knothole is also the home of the Power Ring Grotto, a lake which holds a device that produces a power ring every 12 hours. Created by Uncle Chuck, it gives Sonic a dose of super speed and power that can help him escape even the stickiest of situations. Though the Freedom Fighters are aware of other groups fighting against Robotnik, it is not until Princess Sally reunites with her father briefly (Robotnik having trapped him in an alternate dimension known as The Void along with its discoverer, Naugus) that she learns of the other groups, given a list by her father. Among them are the Wolf Pack, who aid the Freedom Fighters in a plan to defeat Robotnik once and for all. While in the finale of the series Sonic and Sally believe they have won out in the end, the emergence of Snively and a pair of glowing eyes prove otherwise, creating a cliffhanger that would ultimately never be followed up on. After the success of the first Sonic the Hedgehog game, SEGA of America was more than ready to expand the character into other forms of media to capitalize on their success, and broaden his appeal. It was DiC Entertainment who acquired the rights to make the series, having already produced such video game-related shows as The Super Mario Bros. Super Show!, The Legend of Zelda, and Captain N: The Game Master. Their first attempt at creating a Sonic the Hedgehog series was what ultimately evolved into Adventures of Sonic the Hedgehog, a more light-hearted series that was based on humor and slapstick action. When presented to the executives at ABC, they were unhappy with the tone and the quality of animation, asking DiC to retool the concept. Sonic the Hedgehog and the original Freedom Team. Though DiC Entertainment's original ideas were developed for syndication, DiC began work on another, slightly darker series set to match what ABC had asked for. 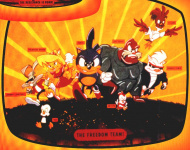 The earliest known designs for the show (published in the 1993 Sonic the Poster Mag) held onto the established cast as seen in the original promotional comic for western audiences, although the characters (with the exception of Sonic) were vastly redesigned. Tux and Chirps were the only ones to remain the same size, though they were given clothing not found before. Johnny Lightfoot and Porker Lewis (who would also be redesigned in the pages of Sonic the Comic, but in a different manner) were transformed into "cool" characters, while Flicky and Joe Sushi became almost unrecognizable. The most prominently featured "new" character, though, was Princess Sally, established even in these early shots as the love interest. Looking more like a yellow cat-esque creature, the concept art implies that the interest between the two is more one-sided on Sonic's part, instead of the more subtle mutual relationship that would be explored in the series proper. It was Len Janson, main Story Editor of both seasons, that helped evolve the series into what would become the released product. Being one of the main authors of the show's bible, he laid out the main players of the cast, defining their personalities and relationships as they would be in the show. The guide, written in 1992, also goes on to lay out concepts that were eventually dropped at some point before the pilot was produced, including the character of Nate Morgan and the idea that Sonic and Sally only met once Robotnik took over Mobius, and not childhood friends as the series later revealed. The world's first look at an animated Princess Sally. The physical designs were worked on over an unspecified amount of time, Tails being added to the main cast and the characters evolving into their season one look with the exception of Princess Sally. In the pilot "Heads or Tails," Sally has a completely different color scheme, with pink fur and black hair. 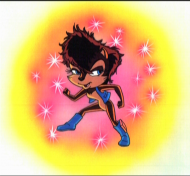 It would only be after the pilot was finished and the series was finally ordered that she would transform into the brown squirrel seen in the rest of the series. While the first season was composed of numerous self-contained stories from numerous writers, Len Janson wanted to try something different for season two. Calling in writers Ben Hurst and Pat Allee (who had worked together on the episode "Sonic and Sally"), the three talked about the direction the second season should take. It was Ben Hurst who had come up with the idea to make each episode a part of a larger story, widening the scope to that of a movie but broken into smaller chunks. With the requirement that each episode should still be a self-contained entity that anyone could jump into (with the exception of the single two-parter), a thirteen-episode outline was produced. Though the story was forced to become eleven episodes after the mandate of two Antoine-centric episodes, the season was truly an experiment that had not been attempted at such lengths in children's animation. It is important to note that almost from the get-go Len had to go toe to toe with SEGA on numerous occasions. Being that the show was so far removed from the plotlines SEGA of America had created, he defending the alterations to the storyline and the characters, trying to show that each change was done for the betterment of their series and the goals it set out to accomplish. Especially in the second season, Len fought to leave the work of Ben and Pat out of the hands of third party involvement. No episode is this more true of than the two parter "Blast To The Past," where days were spent arguing not only that the origin should be explained, but that the character of Rosie the Nanny should have the ending seen in the final product. Concept art of Sonic the Hedgehog revving up with the assistance of a power ring. The series premiered on September 18th, 1993 on ABC's Saturday morning lineup. The first episode that aired was Sonic Boom, the actual pilot not airing until December 11th, becoming the final episode aired that season. The reason for this shift in order is most likely attributed with the tone of "Heads or Tails" being drastically different from the rest of the series, and airing only to fill the needed 13 episodes ordered. The second season premiered on September 10th, 1994 with "Sonic Conversion", even though the next episode aired, "Game Guy", was the first produced. Aside from this switch, the rest of the storyline building in the second season aired as created, with the finale being shown on December 3rd, 1994. Though reruns for both seasons continued to air through May 1995, the show would not be picked up for a third season and was dropped from rotation. Reruns continued to be aired in the United States on the USA Network during their USA Cartoon Express and USA Action Extreme Team morning blocks in the 90's, often being paired with its sister show, Adventures of Sonic the Hedgehog. Currently, reruns are aired by the Starz Kids and Family premium network, and episodes can also be streamed through the Starz website and apps (and through cable/satellite/telco providers' own streaming apps). The show was also aired in Canada on the CTV network, premiering on the same day as in America (mainly for "simsub" purposes, SimSub being a practice by Canadian TV providers where an American network is substituted over by the Canadian station airing that program for people to see Canadian advertising). However, while the show ended its rotation on ABC in May, the Canadian network continued to air the series through the summer, showing the finale once more on September 2, 1995. In Europe, the show initially aired in the UK on Channel 4, between 1994 and 1996. Years later, UK stations Pop and ITV2 replayed the series in syndication. The first season was also shown on Ireland's RTE Two, and the series was eventually dubbed into Japanese. Concept art of Princess Sally powered by the Deep Power Stones. While the series starred one of the most recognizable characters in video gaming, the show was unable to gain enough momentum to create a third season. 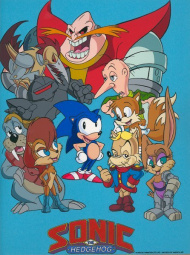 Though for a time it was believed the series had been canceled because of a dispute between SEGA, DiC Enterprises and the ABC Network over the selling of animation cells, the real reasons were nothing as trivial. Through nearly all of its run, the show was forced to compete against the biggest children's show of the era, Mighty Morphin Power Rangers. ABC's first response was to change timeslots for Sonic, but Fox Kids responded by moving their series to the exact slot ABC had shifted Sonic to. Additional problems were presented with affiliates in major markets choosing to preempt some or all of ABC's Saturday morning lineup for local newscasts. Being dominated in the ratings and with apathy from affiliates, what little hope for a renewal was lost when the President of ABC's Children Programming was replaced at the same time, the new regime- backed by ABC's new owner at the time, The Walt Disney Company (which would eventually create the One Saturday Morning block for ABC two years later)- having no interest in perusing a third season (the all-CGI cartoon ReBoot was also cancelled at the same time; it however would continue with episodes via Canada's YTV). Ben Hurst, who had become the main writer of the series by season two, was unhappy with the decision, but continued to hold out hope that he would be able to return and at least finish the storyline he began. Over the years, he attempted time and again to drum up enough interest in the powers-that-be to green light, if not a third season, then at least an animated feature that would be able to tie up the loose ends of the cliffhanger. His passion for Sonic was enough to have him hired in as the story editor for Sonic Underground, though his hands were tied in changing the premise of the show, the elements of the Underground storyline having already been set in stone once he was approached. The last known major attempt at launching the continuation of the series was when Ben Hurst, while talking through DiC in 2002, was told that he should speak to SEGA about the idea, as ultimately it was up to them. Getting in contact with SEGA of America, Ben Hurst later received a phone call from Ken Penders who said he had heard that the writer was interested in getting a Sonic film off the ground. The two spoke at length, Mr. Hurst revealing his ideas of not only putting together a film, but also working in tangent with the gaming side of SEGA to help spur ideas that both could use. Shortly after, Ben Hurst got back in contact with SEGA only to find that Ken Penders had gotten in contact before him, sharing Ben Hurst's intentions and causing a strain between Ben and the person he had contacted within SEGA. He later discovered that Ken Penders had his own intentions of making a feature film that ultimately went nowhere, though it is unknown if Mr. Penders had intentionally caused friction or if was just a moment of Ken speaking without tact at presenting an idea that wasn't his own. Naugus, who was intended to play a larger role in the unproduced season three. Though it was never produced, the outline to what would consist of season three was worked on before word reached DiC of its cancellation. Over the years, Ben Hurst let out certain details of what would have occured had the show continued. The silhouetted eyes featured at the end of "The Doomsday Project" were meant to be those of the wizard Naugus, the void having opened up momentarily during the explosion at the end of the same episode. Even though it was only opened for a moment, Dr. Robotnik inadvertently escapes into the void, so although he survives the blast he immediately becomes tormented by the wizard, the evil dictator's body transformed time and again to Naugus' amusement. Meanwhile, the Freedom Fighters (now called "Freedom Builders") would have begun the process of rebuilding Mobotropolis, Rotor spearheading the transformation. Unbeknown to them, Snively would be sneaking about Robotropolis, gathering intel on the Freedom Fighters and plotting to attack them outright. For a time, Snively is able to place himself in a position of power, proving himself as formidable a foe as Robotnik, if not more so. However, his time as head villain would prove short lived thanks to the efforts of the Freedom Fighters, and in a moment of desperation would free Naugus, Robotnik, and King Acorn from the void. Naugus immediately takes on the title of main villain, using the King as bait to lure Sally in, and making Snively nothing. Robotnik's nephew was slated to defect to the Freedom Fighters in retaliation, although he would secretly plan to betray them at some point, Antoine being the only one to notice - and ultimately stop - Snively's plans. There were also a number of subplots planned for the show, including Tails' relationship with Sonic becoming closer to the games, proving himself a capable Freedom Fighter and even saving the group at one point on his own. There was also a new character slated, who would become a rival for Sally's affection, though in the end Sonic would ultimately come out on top. Robotnik's true origins were also intended to be revealed at some point, the future dictator and his nephew having, after unsuccessfully trying to take over a space station in the year 2200, end of falling through time and landing on Earth. Now known by its animal residents as Mobius, Robotnik felt that "in the land of the four-pawed critters, the two-handed man is king." Knuckles was also considered to be used in some capacity towards the end of season three if SEGA demanded it, who would later be used in a greater capacity in season four. NICOLE, the portable computer of Princess Sally. NICOLE was also meant to have her own storyline, where it would be revealed that before the coup, NICOLE was once a regular Mobian, and had been best friends with Sally. Robotnik, in one of his experiments, lured the young genius into his lab and transferred her entire personality into a computer satellite, the small hand-held computer being an extension of the programming orbiting the planet. However, Robotnik was unable to predict her sentience, which gave her, among other things, the ability to control minds. Coming to grips with her existence, she decided that she could not exist like this, the fear of stripping the world of free will in order to protect it being too great for her. Wiping Robotnik's memory of even creating her, she controls the future-ruler into giving the computer to King Acorn, then wills the ruler to give the same machine to Princess Sally, consoling her over the death of her friend Nicole. Once in her possession, Sally names the computer after her friend, oblivious to the fact they are one and the same. Once set in place, NICOLE creates a program to block out her human, emotional side, becoming nothing more than the computer seen in seasons one and two. At some point, NICOLE was to have been restored to her former self, becoming a part of the Freedom Fighters. Even with all this, it is unknown just how the series was intended to end, although it can be assumed that the result would be the triumphing of good over evil. Though never featured in a game, Princess Sally, Rotor, Bunnie, and Sonic's dog Muttski all made cameo appearances in the game Sonic Spinball during the bonus rounds. In addition, the Sega Technical Institute once had plans on creating a game based on the series, being one of the many concepts thrown around during the "Sonic X-Treme" era. The SEGA theme park SEGAWORLD (located in Sydney, Australia) once featured Princess Sally in a prominent role within the park, making her part of the Sonic Live In Sydney musical puppet show. In the show, Sonic and Tails work together to save Sally from Robotnik, who happens to be in love with her. The original bible for the series, which served as a partial inspiration for the Archie series, was also used for the background in a series of children's novels written by Michael Teitelbaum. In the novel, the meeting between Sonic and Sally as teenagers when the coup occurs is maintained, though it adds its own concepts, depicting Sonic and Robotnik growing up together, something that is not mentioned in the series bible. It and Sonic Boom are the only Sonic cartoons not to have the Chaos Emeralds involved in the storyline. http://www.saturdaymorningsonic.com - Saturday Morning Sonic - a newer SatAM Fan Site, run by PorpoiseMuffins. Audio From The Series - A collection of the various themes used in Sonic the Hedgehog, including alternate opening themes that were unused. Behind the Scenes - A collection of behind the scenes documents, including the original series bible. This page was last edited on 10 March 2019, at 13:04.